KORESPONSIVE is a free theme for WordPress with a fully responsive design. This means that the layout can be adapted to the screen size of all devices, computers, smartphones and tablets. Default style for two types of layouts, one with and one without the sidebar side. For displaying content related to the current post. KORESPONSIVE è un tema gratuito per WordPress con un design completamente responsivo. Ciò significa che il layout si adatta automaticamente alle dimensione dello schermo di diversi supporti come computer, smartphone e tablet. Stile predefinito per 2 tipi di layout, uno con la sidebar laterale e uno senza. Visualizzazione di contenuto correlato all’articolo corrente. Buongiorno, innanzi tutto complimenti per il tema che è davvero stupendo, volevo pero’ chiedervi, dato che sull’ipad la visualizzazione rimane pressochè quella deckstop, come posso matenere il banner di fianco al logo fino alla visualizzazione da ipad. Ciao Jacopo, siamo contenti del successo del nostro tema. Mantenere il banner anche nelle risoluzioni verticali è molto semplice. Basta aprire il file style.css nella cartella del tema e cancellare le righe 1581 e 1600. Grazie mille, vi disturbo ancora per chiedere se si puo’ risolvere la visualizzazione del testo di fianco al post in home page, se visualizzate sull’ipad, in caso di titolo lungo l’immagine rimane fissa e il testo diventa lungo e stretto a fianco. complimenti per tutto, spero di non essere troppo invasivo! Ciao Jacopo, ci dispiace rispondere solo ora ma molti commenti erano finiti nello spam. Per quanto riguarda la tua domanda, una maniera di risolvere è creare una funzione ad hoc che “tagli” i titoli troppo lunghi ad un numero predefinito di caratteri. Speriamo che, nel frattempo, tu abbia già risolto. Il tema proposto in queste pagine è bellissimo! Complimenti! Sono interessata al download free, anche per testare il tema e cimentarmi con esso, ma non riesco proprio ad individuare link ed area da cui scaricarlo. Potete aiutarmi? Vi auguro una buona fine settimana. Firstly, thanks for your great job! It is a fantastic theme! I love it. But there is something that I don’t understand… I want to use the Slider in order to show a cathegory of my web (http://droidpanic.com/). How could I do it? Can you help me please? Hi Droidpanic, we have seen that you have already solved your problem. Forgive the late reply. Is this theme compatible with the latest version of WordPress 3.5.1.? I’m having a hard time using it. Thanks. Can you please advise on how to set-up the slider? I have it enabled but it’s not showing up. adding a slider to koresponsive theme is very simple. First we need to install the theme. After you have installed the theme koresponsive, you’ll see the new menu item “Slides” in the menu on the left side. Click on this menu item. A page will open with the slides that will be displayed in the home page. To create a new slide click on “Add new slide”. To add a picture click on “set featured image”. You can also enter the title and the content of the slider and the link to the page you want to link to. We hope this explanation can help you. hi shige, thanks for your great job! 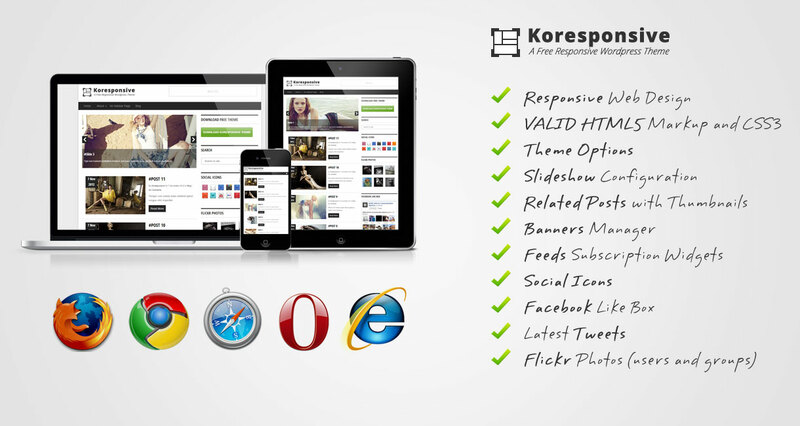 the Koresponsive theme is fully compatible with the latest version of WordPress (3.5.1). There must be some other problems in your Wp installation. Firstly, thanks for this theme! I want to remove the bottom border in the widgets sidebar. Can you help me? Per tutti quelli che hanno avuto difficoltà nell’installazione: Se vi esce “sei sicuro di voler fare questo?” provate ad installarlo manualmente via ftp. Thanks for your great job, this theme is absolutely awesome ! I was wondering, like Droidpanic, how I could set the slider to display last or features articles. He couldn’t tell me how he did… Could you help me, please ? Thanks and again, well done job ! Hey! Really nice theme! I love it! Could you please tell me, how I could insert the Banner in the header on the right? Another question: Is it possible to change the slider that it shows the last posts? I want to show the slider on static home page not on the blog post page. is it possible? Hi, Can you tell me how to change the delay between slides on the homepage? Thanks. 2nd, I want to ask you how to disable responsive in this theme. I want it display the same in both mobile and computer ( tablet also ).